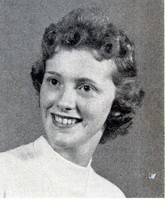 Born: On October 11, 1938 in Easton, Pa, she was a daughter of the late Raymond and Catherine Hughes Davis. Personal: Her husband, George F., died in 2003. She was employed as a sewing machine operator for Jimjam Sportswear Co. in Nazareth, Pa. Survivors: She is survived by two sons, George R. and his wife, Kelly of Saylorsburg, Pa, Eugene N. and his wife, Maria of Lehighton, Pa; a sister, Sharon Fahl of Easton, Pa; her mother-in-law, Mary Trilli of Bethlehem, Pa; five grandchildren, Cassandra, Kathleen, George, Kristina, and Jenna; and her beloved dog, Buddy. Services: The Funeral will be held on Saturday at 11 a.m. in the Finegan Funeral Home, 1837 Washington Blvd., Easton, Pa. Calling hours will be on Friday from 6 to 8 p.m. in the funeral home. Interment will be in Northampton Memorial Shrine. Memorials: Donations may be made to St. Luke’s Hospice, 709 Delaware Ave., Bethlehem, Pa.